Dongfeng PSA, which sells Citroen C5 cars and Peugeot 307 hatchbacks in China, imports parts from France and will benefit from the euro's fall. (Bloomberg) – PSA/Peugeot-Citroen SA's and Volkswagen AG's joint ventures in China will benefit as a weaker euro reduces the cost of components imported from Europe, Nomura Holdings Inc. analysts said. Dongfeng PSA, a partnership between France's PSA and Dongfeng Motor Group Co., will be the biggest beneficiary, said Yankun Hou, an analyst at Nomura. A 15 percent drop in the euro may boost earnings at Dongfeng PSA by as much as 5 percent or 250 million yuan ($36.6 million), Hou and fellow analyst Ming Xu wrote in a report this week. For European carmakers in China, the world's largest auto market, “the import of components from their home countries is one way to make profit,” Hou, based in Hong Kong, said. The euro has declined 14 percent against the U.S. dollar this year on concern that a government debt crisis may spread from Greece, and reached a four-year low against of $1.21 on May 19. The currency's decline increases the competitiveness of Europe's carmakers and auto-parts suppliers in China, where the yuan has been pegged at about 6.83 to the U.S. dollar for almost two years. China is also under pressure to revalue its currency. European auto joint ventures in China rely on imported car parts more than the industry average, Hou said. “China still doesn't have the economical scale to produce high-tech components,” he said. SAIC Motor Corp., which makes cars in China with Germany's Volkswagen and General Motors Co., and Hong Kong-listed Brilliance China Automotive Ltd. will also benefit from a weaker euro, the Nomura report said. Brilliance has a partnership with Germany's BMW AG. Their venture, which sells the luxury carmaker's 5 Series Gran Turismo model for 876,000 yuan in China, imports about 60 percent of its components, Nomura's Hou and Xu wrote. A weaker euro gives Shanghai-based SAIC, China's biggest domestic carmaker, the chance to reduce import costs, spokeswoman Judy Zhu, said in an e-mail without elaborating on the extent of the potential savings. Geely Automobile Holdings Ltd.'s executive director Lawrence Ang said that a stronger yuan may cut the automaker's component costs. The impact of a weaker euro on the maker of KingKong compacts is “not big”, he said. Dongfeng PSA, which sells Citroen C5 cars and Peugeot 307 hatchbacks in China, imports parts from France and will benefit from the euro's fall, Zhang Li, an executive in its investor relations department said on May 24. 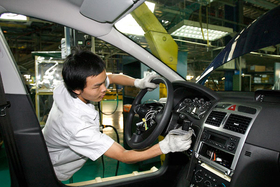 Nomura estimates Dongfeng PSA imports more than a third of its components. Dongfeng's Hong Kong-listed shares rose 3.4 percent to HK$8.77 as of 4.19 p.m. today. Still, euro weakness will have little impact on the majority of Chinese auto companies because they buy most of their components domestically, said Yu Bing, an analyst with Ping An Securities Co. in Shanghai. The euro's decline may give Chinese carmakers an opportunity to make cheaper acquisitions in Europe, Yu said in a phone interview. “It is a way for these automakers to get a foothold in the market and to acquire technology,” he said. In March, Zhejiang Geely Holding Group Co., parent of Geely Automobile, agreed to buy Swedish automaker Volvo Cars from Ford Motor Co. for $1.8 billion in the largest overseas acquisition by a Chinese automaker. Japanese and Korean automakers including Honda Motor Co. and Kia Motors Co. said they are closely monitoring developments in the euro zone. Honda CEO Takanobu Ito said on May 20 that Japan's second-largest automaker needs to strengthen currency risk management as the euro and other currencies weaken against the yen. Honda may increase production flexibility overseas and rely less on exports from Japan, he said. Korean automaker Kia Motors Co. is taking a “wait-and-see attitude in terms of strategic changes,” Michael Choo, a spokesman at Kia, said by phone in Seoul. He declined to comment on whether the company will change its currency hedging policies. Kia gets about a quarter of its revenue from Europe and Russia, according to Bloomberg data. Toyota Motor Corp., the world's largest carmaker, sells about 10 percent of its cars in the region that includes Europe and Russia, spokeswoman Mieko Iwasaki said. A one-yen appreciation of the Japanese currency against the euro reduces Toyota's annual operating profit by 5 billion yen, she said. European sales account for about 15 percent of revenue at Nissan Motor Co., Japan's third-biggest automaker. The European crisis is not affecting business, CEO Carlos Ghosn said on May 12. Nissan may raise its sales forecast for the region as sales there have fallen less than expected, Ghosn said.